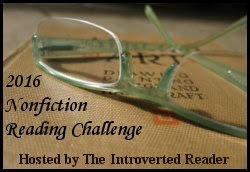 My next book for the nonfiction challenge is from the "True Crime" genre. I never read True Crime. When this arrived at my library for me, I couldn’t think why I requested it, but finally remembered that recent reading about events in Massachusetts in the late 1800s had brought this particular criminal to my attention and I thought it would be a good book to show me more about political and social goings-on. modern readers to the horrific teenage serial killer, Jesse Pomeroy, who preyed on children (primarily boys) from ages ~4 to 8 in South Boston in the 1870s. He was first arrested at the age of twelve for abducting, molesting, torturing and mutilating a series of young boys. Convicted of the crimes, he was sent to reform school. There, he managed to behave himself long enough to win early release after only about 18 months. Shortly after he returned home, he graduated from torture to murder. 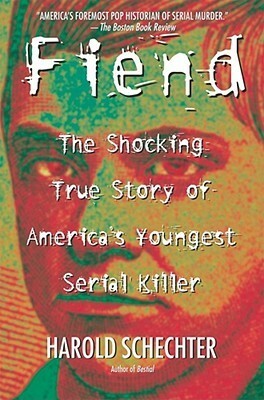 Fiend is well researched and presented in a concise, journalistic style. It shows the horrific crimes of this sociopath in graphic detail that make parts of the book difficult to read. Schechter does a good job recounting the reaction of the public to the knowledge that there was a child-killer loose in Boston. It explains how Pomeroy was caught, tried, sentenced, and eventually punished. The author’s theme is how little has changed over the centuries: sociopaths and serial killers have always been with us. There have always been "evil" children. And there has always been societal confusion and controversy over how to deal with them. I’m not going to become a devotee of true crime stories, but this was an interesting account of a notorious criminal, whose actions are placed within the historical context of the time between the Civil War and WWI. 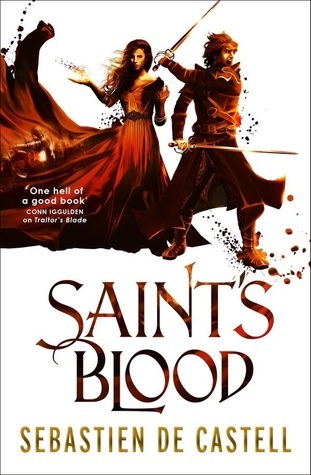 Falcio, Kest, and Brasti are back in Saint’s Blood, the third installment of the four-part fantasy adventure series Greatcoats by Sebastien de Castell. If you enjoy swashbuckling fantasy with violence, friendship, pathos, and humor, start off the adventure with Greatcoats #1: Traitor’s Blade followed by #2: Knight’s Shadow. 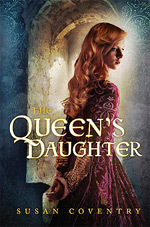 In this latest tale, the few remaining Greatcoats (a band of king’s lawkeepers) are attempting to restore order to Tristia, which now being governed by Valiana, the Protector of the Realm, the young woman Falcio has adopted as his daughter. Meanwhile the land awaits the coronation of the fourteen-year-old Aline, heir to the throne. After all the horrors endured protecting Aline while pretenders battled to kill her and rid themselves of interfering Greatcoats, Falcio learns there is another, even more terrifying foe to face. Someone is killing the Saints (mystical protectors of the people–there are saints for just about everything). Desperate pilgrims are swarming about. The church has gathered its own force of Knights and brought back the dreaded Inquisitors as well. Falcio and his crew have to find out who is behind this latest threat, while keeping themselves and the Protectress and princess alive–not to mention the woman Falcio loves has been elevated to sainthood and is now on the murderer’s hitlist. Avoiding spoilers, things go from bad to worse for Falcio, the Greatcoats, and Tristia in general, but the dedication of the hero inspires the rest. Despite the seriousness and bleakness of the themes, the three buddies hold onto a shred of humor, which is what make this series such fun. The plotting is farfetched but this is fantasy, not realistic fiction. It’s meant to be a gripping page-turner and it succeeds. There is one more book planned in the series, and I look forward to seeing how the Greatcoats will ultimately prevail. Or not? I’ve read a handful of Georgette Heyer’s Regency Romances and am always charmed by them. It’s wonderful that there are so many so that I can grab one whenever I’m in the mood for light-hearted romance that won’t disappoint. However, Heyer has also written historical novels that are not romances, as well as historical mystery/detective stories. 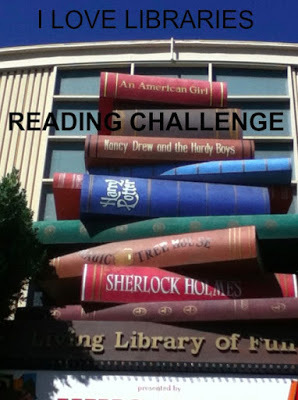 I have a couple of these on my shelf, but it took the Back-to-the-Classics Challenge to get me to finally read Penhallow. A quick check of goodreads will show that this classical detective story gets mixed reviews, largely because it’s not a typical detective story at all. There is a murder, but it doesn’t take place until more than half-way through the story and by the time it finally takes place, the reader is anxious for someone, anyone, to murder the guy. Adam Penhallow is the patriarch of a large, dysfunctional family. Elderly, largely bedridden, his one joy in life is making others suffer. His brood of sons (men who are in their twenties to forties) mostly live in the old family home, sponging off their father. Only the eldest, Raymond, shows any sort of industry, managing the estate and breeding horses for money and for the love of it. The others are hanging on, waiting for their father to die, and squabbling nastily with each other to pass the time. The women in the crew are miserable and want out. This primarily includes Adam’s second wife, Faith, who is trapped in the marriage and serves as punching bag for one and all, and the wife of one of his sons, Vivian, who is spirited enough to fight back against her father-in-law, but who is equally trapped because she loves her husband who is too lazy to move out and support himself. All of the sons prefer to suffer their father’s continual abuse than to lose access to the money and indolent lifestyle that living with him allows. Things are changing, though. One son wants to make an unsuitable marriage. Another, who has escaped to live in London, is deeply in debt and is being forced to move home against his will. The youngest son, who is Faith’s only child, is doing poorly at University and has been recalled home where he will be terrorized by his father and brothers. The novel sets the scene slowly, developing the unpleasant characters with such precision that it’s impossible to like any of them. Their dysfunction and awful personalities can be blamed squarely on the tyrannical father, Penhallow. The storyline is not a whodunnit but rather a which one is going to do it. Once the murder happens, there is no doubt who the killer is, but rather the question is what will happen to the family now. It’s a wonderfully crafted tale. The murder of the evil tyrant doesn’t free his family to live their lives, but rather unleashes a cascade of further tragedy. It’s a tribute to Georgette Heyer’s skill that I could not look away from this train wreck, but needed to read the book straight through. Disclosure: I won this book from Goodreads! This did not influence my review. I’ve been trying to catch up on C.W. 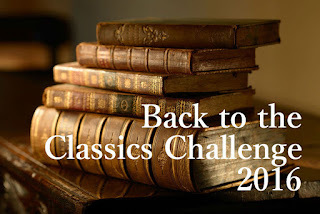 Gortner’s backlist, but I keep getting captured by his new releases (Mademoiselle Chanel and The Vatican Princess: A Novel of Lucrezia Borgia). His latest offering is Marlene, on sale May 24. I’m thrilled to have won a review copy through Goodreads. Gortner consistently provides his fans with well-researched, engaging, fictional historical biographies of larger-than-life women who defy convention to make their own way in the world. Like the heroine of Mademoiselle Chanel, Marlene Dietrich is brought up in poverty but clambers up and out through a combination of talent, drive, and an understanding of her sexual power. Marlene is exceptionally beautiful and well aware that she possesses a certain something that men and women find irresistible. Marlene is a born performer. It takes her a while to find her niche, starting off as a musician at her mother’s instigation, but moving on to singing and dancing in cabarets (in the wild, unrestrained days of the Weimar Republic), while taking classes in acting. Marlene is also a champion networker. Through friends and connections, she is introduced to two men who will define her future: her husband, Rudi Sieber and her first serious director, Josef von Sternberg. With von Sternberg she makes The Blue Angel, a movie that catapults her to stardom. With Rudi, she finds a husband who permits her the freedom to move about at will, indulging her passions and working her way up the movie-making ladder. The success of The Blue Angel attracts the attention of Hollywood, and Marlene moves to the U.S. during the lead-in to WWII. There she makes her home throughout the war. Marlene is appalled by what is happening in and to Germany. Eventually needing to take a public stand, she becomes a performer for the USO, venturing into dangerous, war-torn countrysides to entertain the troops. 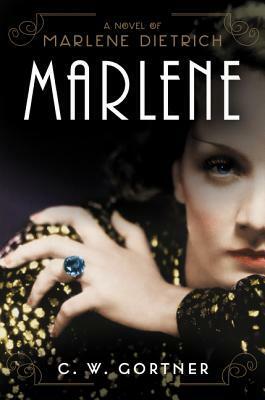 Marlene brings to life this fascinating, bold, determined woman as well as putting a spotlight on life in Berlin between the wars. CJ Samson meets Shakespeare in Love - a historical thriller with a swashbuckling twist and a hero like you've never seen him before. When he's caught out by one ill-advised seduction too many, young William Shakespeare flees Stratford to seek his fortune. Cast adrift in London, Will falls in with a band of players - but greater men have their eye on this talented young wordsmith. England's very survival hangs in the balance, and Will finds himself dispatched to Venice on a crucial embassy. Dazzled by the city's masques - and its beauties - Will little realises the peril in which he finds himself. Catholic assassins would stop at nothing to end his mission on the point of their sharpened knives, and lurking in the shadows is a killer as clever as he is cruel. As a new convert to the historical thrillers of C.J. Samson, I thought I would enjoy this one. The premise is promising. Unfortunately, the story takes a long time to get going, and even though at 448 pages it isn’t overly long, it reads much longer. Roughly the first half of the book is taken up setting the stage for the adventure. It establishes young Will Shakespeare as a thoroughly unlikeable character, a man far too full of himself, whose idea of a clever prank to forestall the vengeance of a powerful townsman he has insulted is to seduce that man’s pretty young daughter. Since the girl doesn’t mind, I suppose we are supposed to cheer his lark. But it brings down more trouble on his doting parents and long-suffering wife and children and he’s banished to London. He’s a bit miffed to learn that his family is able to get along happily without him. He joins forces with a troupe of players, making some new enemies along the way, none of whom will actually be important to the plot. 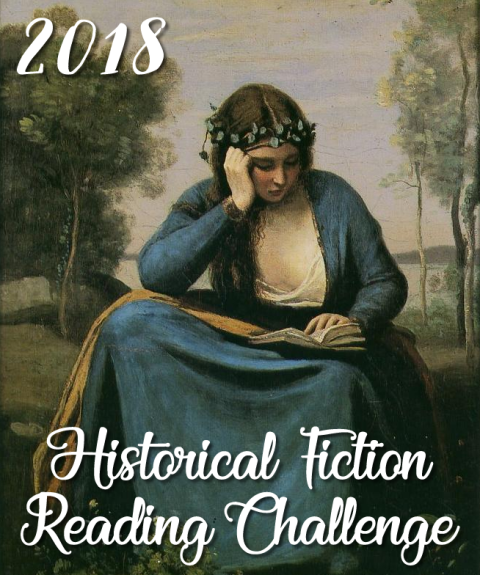 This set-up plods along, but I continued reading with the hope that the pace would pick up when Shakespeare and his crew finally connected with the main thread of the story. There are other forces at play. Already at odds with the Pope, England fears she will soon be at war with Catholic Spain. She needs an ally and turns her face to Venice, a powerful city whose only allegiance is to whoever serves her interests. The Queen’s spymaster is setting out to offer an alliance to Venice. For some reason, he feels the need for an additional spy, someone who is clever but not too clever, so he searches around for a player and chooses Will. Finally, the story moves on to Venice. It’s a fairly dull trip, necessarily punctuated by the spymaster’s lecturing to Will about current politics, until their company is accosted by that of the villain, an agent of the Pope. Once the meat of the story begins, the pace picks up, but the complicated plotting of the various people involved is laid out in such detail that there isn’t much mystery or suspense. Things just have to wind their way to the violent conclusion. Since we know William Shakespeare has gone on to better things (and will incorporate names and situations from his Venice adventure into his later plays), there isn’t even much concern how things will end for him. The goals of the main characters are fairly straightforward and credible, but some of the situations are not particularly plausible. Overall, the story at half the length would have been an enjoyable romp but I was out of patience before the spy ever made it to Venice so I don’t think I was able to appreciate the unfolding of the tale. The May issue of Historical Novels Review, the journal of The Historical Novel Society is now out. You can check out the online version of the journal here. 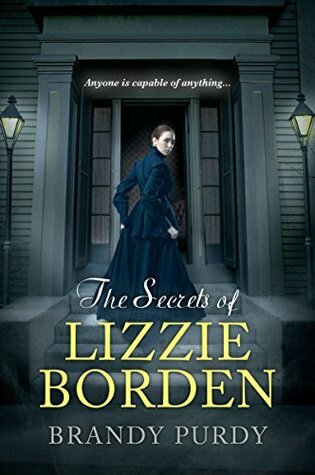 The Secrets of Lizzie Borden by Brandy Purdy. 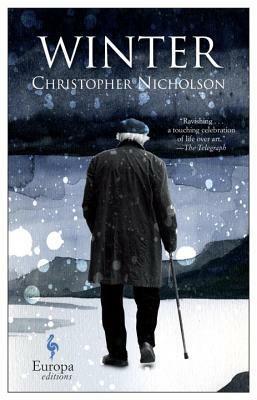 And Winter by Christopher Nicholson. The new novel from the author of the Costa Best Novel-shortlisted 'The Elephant Keeper'. In the winter of 1924 the most celebrated English writer of the day, 84-year-old Thomas Hardy, was living at his Dorset home of Max Gate with his second wife, Florence. Aged 45 but in poor health, Florence came to suspect that Hardy was in the grip of a romantic infatuation. The woman in question was a beautiful local actress, 27-year-old Gertrude Bugler, who was playing Tess in the first dramatic adaptation of Hardy's most famous novel, 'Tess of the d'Urbervilles'. Inspired by these events, 'Winter' is a brilliantly realised portrait of an old man and his imaginative life; the life that has brought him fame and wealth, but that condemns him to living lives he can't hope to lead, and reliving those he thought he once led. It is also, though, about the women who now surround him: the middle-aged, childless woman who thought she would find happiness as his handmaiden; and the young actress, with her youthful ambitions and desires, who came between them. Mr. Eternity by Aaron Thier (available on August 9th) is a very odd book. . .odd in a very good way. Daniel Dafoe is on an eternal quest to find the love of his life, Anna Gloria. She’s always just around the bend. Sometimes he thinks she was someone he knew and didn’t recognize until too late; other times, he thinks he has found her but realizes it isn’t her. But the quest drives him on. As the reader travels deeper into the lives of the narrators more links become apparent, stitching together a remembered history of time–the details are not important, only the essence. The novel is a warning against climate change, but also presents a fatalistic view that the change is inevitable. No warning will prevent the world’s end, but it doesn’t matter because the world has ended many times. In Dafoe’s eyes, everything was once wilderness and is again. The civilization in between was not so impressive either. Yet, except for missing Anna Gloria, he is eternally content with things as they are. Those who come into contact with him try, with varying degrees of success, to emulate his outlook. At the beginning of the book, I found the read a bit too weird, too contrived, with elements of magical realism that didn’t really appeal to me, and yet, I couldn’t stop reading. Before long, I was totally immersed. 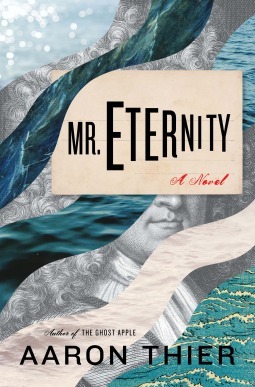 If you are looking for something entirely different, I recommend Mr. Eternity. It’s possible I’ve read too many novels with similar premises in recent times and I’m burning out on them, but this one disappointed. Actually, despite the protagonist being a bookstore owner, books play no role in the story and there is much more alcohol and cigarettes than coffee. The novel starts in the aftermath of the horribly tragic death of Diane’s husband and daughter. She’s devastated, naturally, and wallowing in her misery. She blocks out her in-laws and her parents, convinced that no one else could possibly feel any pain over the loss, which is all her own. The only person she can communicate with is her old college friend, Felix, who, conveniently, is gay, so there is no confusion over the status of their relationship. 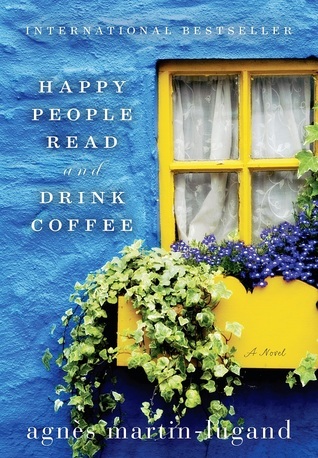 She does own a literary café, but it was purchased for her by her parents and husband so that she would have something to do. It seems she then left much of the day-to-day running of the store to Felix, especially after the deaths of her family members. There are no bookish references or literary insights to make the reader think Diane is a bibliophile. It seems more that Parisian bookstore cafés are cool so she wanted to own one. Felix has been trying to get Diane to emerge from her grieving solitude for a year. Tired of his hovering, she decides to run away to a tiny town in Ireland where she can hide from the world and continue to brood. However, once she gets there, she is distracted by her handsome, extraordinarily rude neighbor. She becomes obsessed with getting revenge on him for his nastiness. Of course, after some back and forth bickering, they fall in love, despite all the emotional baggage they are both carrying. The question is whether their love will be enough to overcome all their problems. The novel is short and moves along pretty quickly, but I never really found myself caught up in the romance. I thought the dialogue was somewhat flat and unconvincing, which may be the result of it being a translation of a book originally written in French. The book was long on angst but short on charm. If I’d been more prepared for a "second chances" romance, I might have enjoyed it more. Unfortunately, the title that was so promising seemed to be promising me a different story than it delivered.